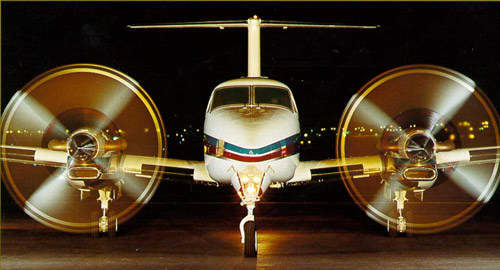 The Beech King Air 350 twin turboprop 11-passenger business aircraft. 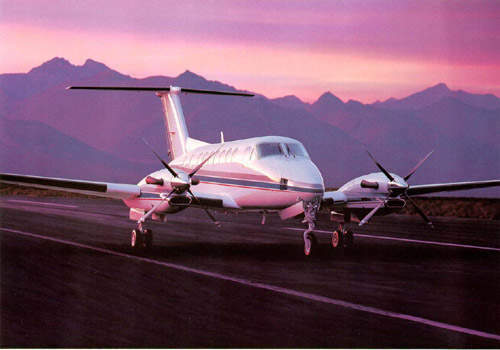 Over 500 King Air 350 have been sold since the aircraft took its first flight in 1988. 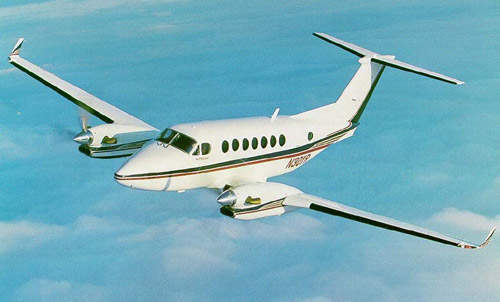 The 350 is one of three current production versions of the King Air, along with the B200 and the C90B. King Air 350 on the runway. The King Air 350 has been sold for military applications, equipped for special missions, maritime patrol, electronic intelligence and reconnaissance. The aircraft has two Pratt & Whitney PT6A-60A reverse flow, free turbine engines, each rated at 1,050shp. The aircraft's maximum speed is 583km/h and it has a cruise range of 3,280km. The 350 has four-bladed, aluminium alloy automatic feathering reversible-pitch propellers. The Beech King Air 350 twin turboprop 11-passenger business aircraft first flew in 1988 and has been built in civil and military versions. Over 500 King Air 350 have been delivered. The Beech King Air product line has been in continuous production since 1964 and more than 6,000 of 17 variants have been sold for corporate, commercial and special mission operations to more than 94 countries. Beech Aircraft Corporation, the original manufacturers, became a wholly owned subsidiary of Raytheon in 1980. The company has continued to incorporate improvements and additions to the King Air aircraft. 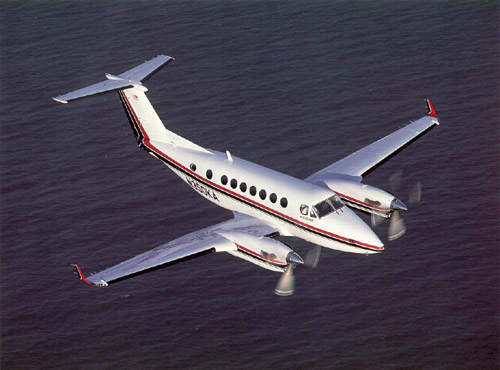 As well as the King Air 350, the current production versions include the King Air B200 and the C90B. The B200 transport and utility aircraft is shorter than the 350, the C90B is the entry level variant with seating for four passengers and a range of 1,050nm. In December 2006, Raytheon announced the sale of Raytheon Aircraft to GS Capital Partners. The new company is called Hawker Beechcraft Inc and the sale was completed in March 2007. In October 2008, Hawker Beechcraft announced the new King Air 350i which has new redesigned cabin interior with Rockwell Collins Venue integrated cabin management system (CMS), new Beechcraft FlexCabin which allows easier cabin configuration. In addition cabin sound levels have been reduced to an average of 78dBA. 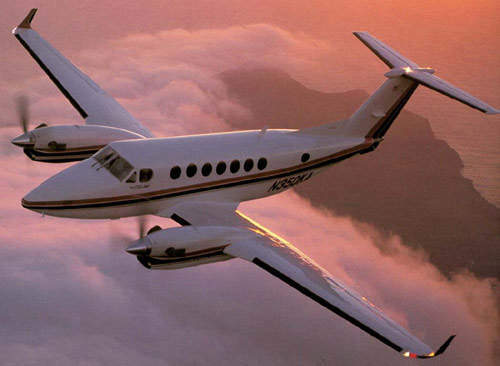 The first flight of the King Air 350i is scheduled for early 2009 with Federal Aviation Administration (FAA) certification planned for the third quarter of 2009 and deliveries to commence shortly after. European Aviation Safety Authority (EASA) certification is expected in early 2010. The King Air 350 special mission version is available as a surveillance aircraft fitted with cameras. A maritime patrol version capable of carrying up to 1,300kg mission equipment is equipped with air and sea search radar and a forward-looking infrared. Life rafts and survival kits can be dropped through a hatch. A Guardian RC-350 military electronic intelligence version is capable of loitering on-station for over six hours at an altitude of 10,500m. 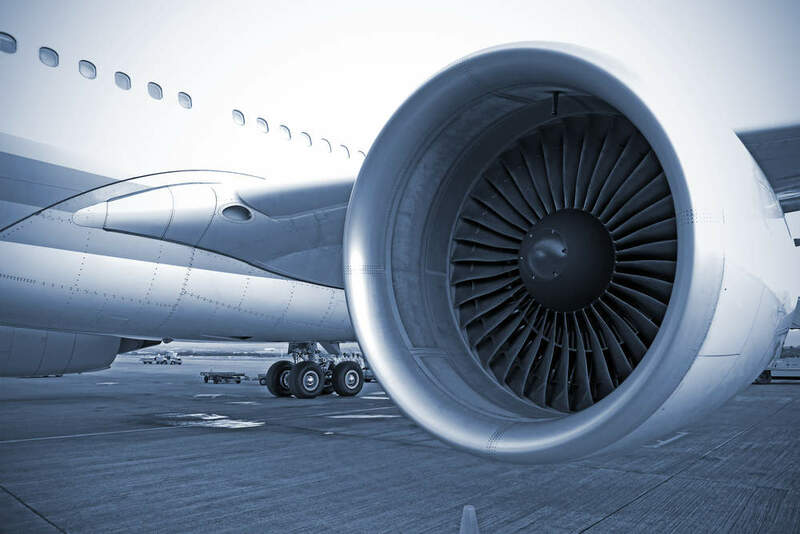 The aircraft can monitor radar emissions in the range 20MHz to 18GHz and can intercept communications in the bands 20MHz to 1.4GHz. The aircraft’s mission equipment includes a Raytheon AN/ALQ-142 electronic support measures system with the antennae installed in wingtip pods, a Watkins Johnson radio communications interceptor type 9195C, a Cubic secure digital up and down data link, a Honeywell laser inertial navigation system and a global positioning system. The communications intelligence systems antennae are installed in an under-fuselage fairing. The King Air 350 entered service with the Japan Ground Self Defence Force in 1999 carrying the JGSDF designation LR-2. The aircraft is equipped with reconnaissance and communications systems. The Royal Australian Air Force is leasing seven King Air 350 aircraft for navigator training and the Australian Army is leasing three aircraft for command and control, communications support and surveillance. Raytheon has developed a new extended-range special mission variant, the King Air 350ER. The 350ER has additional nacelle fuel tanks, heavy-weight landing gear and a maximum take-off weight increased to 7,480kg (16,500lb). This gives the aircraft an extended range of 4,260km (2,300nm) and eight-hour endurance. The 350ER received certification in November 2007. 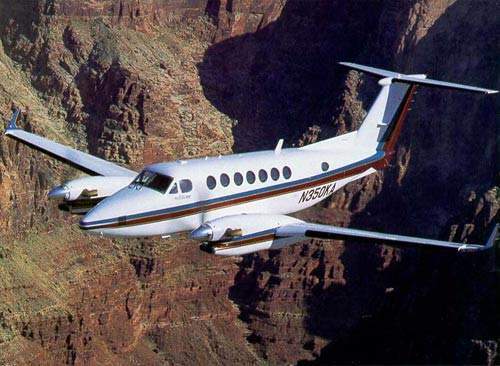 In March 2007, the Government of Iraq placed an order for five King Air 350ER special mission aircraft for intelligence, surveillance and reconnaissance and one for transport. Total requirement is for 24 special mission and 24 transport aircraft. The special mission aircraft are to be fitted with the L3 Wescam MX-15 electro-optic / infrared system, a General Atomics Lynx synthetic aperture radar / inverse synthetic aperture radar (SAR/ISAR), AN/AAR-47 missile warning system and AN/ALE-47 countermeasures dispensing system. In November 2008, the US Air Force placed an order for 23 King Air 350ER for delivery from 2009. The flight deck seats a crew of two and is fitted with dual controls although it can be flown by a single pilot. The aircraft was fitted with Rockwell Collins ProLine II avionics suite with a Universal UNS-1D / UNS-1K navigation system, ALT-80A altimeter, dual airspeed indicators and a flight director and an optional Rockwell Collins EFIS-8B electronic flight information system with three tube multifunction displays. The King Air 350 is now being offered with the Rockwell Collins Pro Line 21 avionics suite as standard equipment. This includes 8in×10in primary flight displays based on active matrix LCD (liquid crystal display) technology and a multi-function display with primary engine information, systems synoptics, checklists and navigational data including planning maps, present-position maps and heading. Terrain, traffic, lightning, weather radar and other sensor information can also be displayed. Pro Line 21 includes: the FMS-3000 flight management system (Dual FMS is optional), dual flight directors, fail-passive autopilot, Global Positioning System (GPS), dual solid-state attitude heading reference system (AHRS), dual digital air data computers and turbulence detection radar. A Rockwell Collins remote radio tuning unit (RTU) provides centralised control of the Pro Line 21 radio tuning. From 2005, the AirCell ST3100 Itridium satellite telecommunications systems will be standard equipment on new aircraft. The King Air 350 has a comfortable and roomy ‘squared-oval’ pressurised cabin. The air-conditioned cabin is fitted with double club-style seats for eight passengers plus up to three single seats. An Ultra Electronics UltraQuiet active noise control system reduces the in-flight noise to under 80dB(A) in the passenger cabin. The active UltraQuiet system acoustically cancels propeller noise in the cabin by introducing sound waves that are of equal frequency and amplitude but are of opposite phase to the unwanted noise. The King Air 350 has two Pratt & Whitney PT6A-60A reverse flow, free turbine engines, each rated at 1,050shp. The Hartzell propellers are four-bladed, 266.7cm aluminium alloy automatic feathering reversible-pitch propellers. The aircraft’s bladder cells and integral fuel tanks in each wing provide a usable fuel capacity of 1,438l. Auxiliary fuel tanks located inboard of the engine nacelles bring the total usable fuel capacity to 2,040l. The hydraulically retractable tricycle-type landing gear has twin-wheeled main units and a single-wheeled steerable nose unit. The gear is equipped with Goodrich tyres, Goodrich hydraulically operated multi-disc brakes, and Beech oleo-pneumatic shock absorbers. The main gear retracts forward and the nose unit retracts rearward.